From one writer to another. NaNoWrimo has officially begun. The short end of “official rules” is achieving an average daily word count of 1,667 words for 30 consecutive days. I was fortunate enough to have the inspiration and motivation to crank out that first milestone before bed last night. Today, I and my fellow Lansing writers gathered for a modest kick off, and I managed to collect 6,000 words toward the story. It’s disjointed at best. A mosaic of story segments that will, with time and effort, be what I hope is a wonderful story. I already like the characters that I have introduced. It helps to be enamored to your characters, or else why are you writing them? It’s amazing to sit in a room full of people who are as passionate about their stories as you are with yours. Wordsmiths and bibliophiles and wonderful people who enjoy the written word in all its forms… this month is off to a beautiful start and I can’t wait to experience the rest of it with my fellow writers. And we are writers, all of us. If you write, you are writer, public opinion be damned. If you created something out of words, you are its author. That’s the way I see it. Granted, I hold myself to a higher standard than I hold others. I like to create more hurdles for myself than might be necessary. 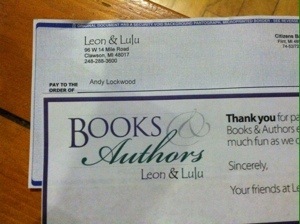 But today, even by my own lofty standards, I can say: I am an author. I checked two pretty big items off my bucket list. This is the first one… you have to wait for the second until it’s official. This entry was posted in Announcements, Reflections and tagged authors, Leon & Lulu, nanowrimo, National Novel Writing Month, paid author, passion, writers, writing by randomgauge. Bookmark the permalink. So proud of you, Andy! You totally rocked Nano!